The charm that Udaipur holds can be seen from the names that it has been bestowed with. The City of Dawn, the City of Lakes and Venice of the East are just a few of the names with which Udaipur is often referred. Udaipur presents a historical spectacle which is sure to spellbind every visitor with its unequivocal architectural beauty and hypnotic cultural vibrancy. Located in the state of Rajasthan, on the southern side of the majestic Aravalli hills, this city attracts travellers from all over the world. Whether you are seeking a holiday with nature and scenic beauty or amidst the grandeur of ancient structures, whether you are looking for a break from monotony by indulging in some cultural colourfulness and pampering of palate with mouth-watering cuisines, Udaipur is the answer to all your holiday dreams. Historically the city of Udaipur was also the capital of Mewar Kingdom, after it was founded in 1553 by the Maharana Udai Singh II. The palaces, grand gardens, museums and cultural shows present a glimpse of its rich past, while lakes and surrounding hills soothes your soul and promise a refreshing stay. One can explore this city in a hassle free manner by choosing suitable a package from our list of Udaipur Tour packages which we at Udaipur Tourism, a division of Holidays DNA, have carefully created as well as accumulated by working closely with various tour organizers in Udaipur. On the east bank of Lake Pichola, Udaipur City Palace is a glorious palace which comprises of four magnificent massive palaces and many small palaces. Each presenting a spell-biding architectural beauty with beautiful balconies, canopies and towers. The city palace complex also houses a museum. Also known as Jag Niwas, Lake Palace (Taj Lake Palace) is now a luxury hotel with more than 80 rooms and suites. 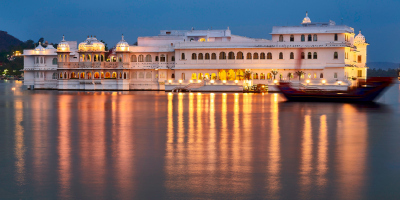 A must place to visit through a Udaipur tour package, Lake Palace has been built on the island of Jag Niwas in Lake Pichola, which in turn guarantees a breath-taking surroundings. Built between 1743 to 1746 during the rule of Maharana Jagat Singh II,this palace turned hotel, still presents the grandeur of bygone eras. Its white and black marble walls, adorned with semi-precious stones, accompanied by lush green gardens, fountains, pillared terraces, etc. make your visit to this palace a memorable one. Used as summer resort and for hosting parties by the royal family, Jag Mandir was built between 1151 to 1652. Its construction can be attributed to three Maharanas of Sisodia Rajputs from Mewar reign. This palace, located on an island in Lake Pichola, comprises of many beautiful structure that in itself are a popular tourist attractions. Gul Mahal, garden courtyard, Datikhana, Bara patharon ka mahal, Zenana mahal and Kunwar pada ka mahal are few of the buildings inside the complex of Jag Mandir. It has been built in the style of Rajput architecture. Built in 1884 by the Maharana Sajjan Singh, Monsoon palace was used as monsoon resort. It was also used as hunting lodge by the royals of Mewar Kingdom. Also known as Sajjan Garh Palace, it is constructed on the Bansdara hills and presents its visitors with a breathtaking view of Fateh Sagar Lake. Constructed over 400 years ago, Ahar Cenotaphs is located in Ahar, just 3 km east of the Udaipur. A royal cremation ground, Ahar cenotaphs consist of around 372 cenotaphs of various kings and queens of Mewar Kingdom. The most captivating cenotaph here is of Maharana Sangram Singh (r 1710–34) while most the recent was built in 2004. It is the honour of last Maharana of Udaipur- Bhagwat Singh (r 1955–84). At a distance of just 150 meters from cenotaphs is the Ahar Government Museum which showcases a wide and rare collection of copper and earthen pottery, sculpture of Hindu Gods, Jain saints and many more. Built in 1651 by Maharana Jagat Singh I, Jagdish Temple is another popular attraction to see in Udaipur. Dedicated to Lord Vishnu, this temple presents an mesmerising example of Indo-Aryan style of architecture. With carved pillars, intricately painted walls and alluring ceilings, this temple is not just a place for devotees but for every history and architecture lovers. An artificial fresh water lake which was built in 1362 AD, Lake Pichola is impossible to miss when on an Udaipur Tour. On this lake are located some of the most popular places to visit in Udaipur such as the islands of Jag Niwas and Jagmandir. On the eastern bank of the lake stands the City Palace. A boat ride in the lake which offers an unforgettable view of the city is quite popular among visitors. Artificial lake, named after Maharana Fateh Singh, Fateh Sagar Lake is located on the northern side of Lake Pichola to which it is connected through a canal. Surrounded by hills and woods, this lake makes for a delightful visit. In this lake stands the Nehru Island and a small islet consisting of Udaipur Solar Observatory, also known as Connaught Bundh. Also known as the garden of maidens,Saheliyon-ki-Bari was constructed by the Mewar ruler, Maharana Sangram Singh II. An alluring site as build for the 48 women attendants who have accompanied a princess to Udaipur as a part of her dowry. This garden consisting of lotus pool, fountains, kiosks, marble elephants and a museum is a popular place to visit. Located at Gangaur Ghat, by the side of Lake Pichola, this magnificent palace was built in 18th century by the Prime minister of Mewar- Amar Chand Badwa. With more than 100 rooms showcasing a rich and rare collection of modern art and costumes, and the exquisite interiors which has been made with glass and mirror work, a trip to this haveli is worth planning. Apart from these top sightseeing places in Udaipur, you can plan a visit to places such as Gulab Bagh and Zoo, Shilpgram, Sukhadia Circle, Jaisamand Lake, Udai Sagar, Doodh Talai Lake, The Crystal Gallery, Badi Lake of the Jiyan Sagar, Lake, Bharatiya Lok Kala Mandal, and many more. For those looking for something extra, they can book one of the listed cab operators in Udaipur and visit to places such as Under the Sun Fish Aquarium, Vintage Car collection at the Garden Hotel, Wax Museum, Udaipur Biological Park, and Navlakha Mahal. The city of Udaipur apart from alluring travellers with its extensive range of tourists attractions and activities, also presents an equally interest range of destinations to visit nearby. There are many amazing weekend destinations near Udaipur that travellers can include depending on the duration of their Udaipur tour packages. Some of the destinations that are in close proximity and can be visited within two to three hours of time are Nathdwara (52 km), Ranakpur (93 km), Ambaji (171 km), Gandhinagar (234 km), Dungarpur (103 km), Kumbhalgarh (102 km), Banswara (165 km) and Mount Abu (165 km). Other popular destinations such as Chittorgarh (117 km), Jodhpur (250 km) are also located quite close and can be reached within 4 hours of journey. If you have more time in hands, you can plan a visit to places like Jhalawar (306 km) and Sawai Madhopur (378 km) which will take around 6 hours of time to reach. Although tourists can visit Udaipur at any time of the year as and when it suits their schedules, it is advisable to visit the city winter and post monsoon. The best time to visit Udaipur is from the month of September to March. Udaipur is well connected by airways, roadways and railways. Hence reaching this wonderous city is easy and convenient to travellers of all age groups. The city has airport named Maharana Pratap Airport, which is also known as Dabok Airport. Regular flights operate between Udaipur airport and airports of Delhi and Mumbai. For those travelling by trains or buses, the city enjoys a good roadways as well as excellent railways, connecting it to cities and towns not only in Rajasthan but from other parts of the country too such as Mumbai, Ahmedabad, Agra, Chittorgarh, Ajmer, Sawai Madhopur, Jaipur, Delhi, Khajuraho and many more. For commuting with the city of Udaipur travellers will find umpteen of options varying from city buses to autorickshaws to bicycles. Bicycles, although an usual mode of transportation, is quite a popular which is not only environment friendly but also cheap way to explore various sightseeing places in Udaipur. Auto Rickshaws are also quite popular. However, one of the best way to visit various places in Udaipur is via a taxi, which can beat pollution and heat/cold as well as allow to reach in a utmost comfortable manner. Tourists can either search a local taxi service after reaching the city or book in advance from these car rental companies in Udaipur.